I have been working on this commission on and off for the past few months but this month I am determined to complete it! I am really enjoying the painting this piece and I’m super excited to see it complete…I also am certain my clients are looking forward to finally having the painting! The last post regarding the progress was just of the background being painted in….but now look at it! 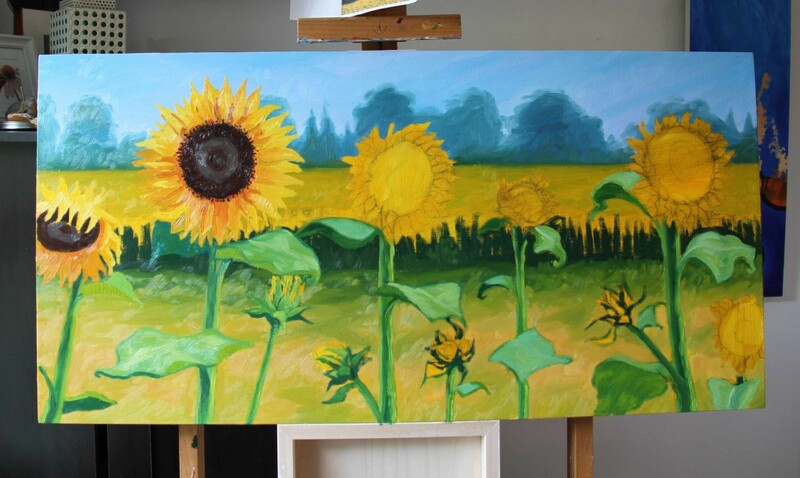 As you can see with the progress shot, the background has remained the same BUT the sunflowers in the foreground are starting to take shape! I began with the stems, they just seemed easier to tackle as I wasn’t entirely sure how I wanted the petals to fall or what colours I wanted to use. The leaves are a fun challenge. As an artist you have to train yourself to really pay attention to the details of the object you are painting. I realized a year or so ago while painting a waterlily pad that the underside of a leaf is bright green but only if light is shining over it. If it’s in shadow then it has a blue green hue. Now in contrast the leaf’s surface is a cooler shade of green, usually a bluish green that is a tint. I guess it’s just reflecting the sky? I don’t know the science behind it but I just know what I see…so I’m using this observed knowledge to help me paint a more realistic leaf. This painting is more of a challenge than some of my others because I do not have a photo reference to go by…this painting is comprised of found reference imagery with a few shots of my own but nothing is 100% reliable. So I have to use my artistic sense to really make things come together and feel ‘real’ though my main objective isn’t to have a painting that is photo-realistic. I aim to create a piece that is true to my style, which veers from impressionistic and hints at realism and graphic, if that makes sense! As for the flowers themselves, the petals are another issue. I have decided that in shadow they will be an ochre but when light is directly above then the shadow takes on a warm orange hue. I might have to tweak the colours here and there but in the end I’m sure it will work out!